A study of the many mysteries surrounding the death of Crown Prince Rudolf of Austria-Hungary and his mistress. The conventional story holds that the couple was at Mayerling, Rudolf’s hunting lodge, where he shot her, then sat with her body for hours before shooting himself. A story of love denied and lovers united forever in death? Maybe not. 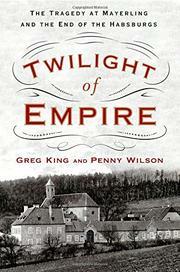 King and Wilson (co-authors: Lusitania: Triumph, Tragedy, and the End of the Edwardian Age, 2015, etc.) first establish the miserable life of Rudolf. His father, Emperor Franz Joseph, treated him like a military cadet with no power or influence. His mother, Empress Elisabeth, escaped her vicious, controlling mother-in-law by ignoring her only son. The only time his mother stepped up was when she demanded that Rudolf’s governor, appointed by Franz Joseph, be replaced. A cruel, abusive man, he drove his young child to a nervous breakdown. His new governor fed Rudolf’s intelligence, although he may have overdone it, with dozens of different instructors giving lessons. Rudolf was smart and talented, and he was inclined toward modern thought, intellectuals, and the idea of a prosperous middle class. He was also volatile and often threatened suicide, waving his gun around and begging others to commit suicide with him. His many affairs left him with a venereal disease, which he passed to his wife, causing sterility and leaving no hope of a royal heir. His affair with Baroness Mary Vetsera was arranged by her mother, wealthy social climber Helene Baltazzi, and Rudolf’s cousin, Marie Larisch. Helene’s motives for prostituting her daughter were to gain access to the right places and people. Marie’s motives were strictly mercenary. Helene gave her money and clothes while Mary and Rudolf were victims of her blackmail. There are many theories of why and how the two died, even that Rudolf was quite finished with Mary, who may have been pregnant. Rumor upon rumor abounded, and the authors lay out a variety of theories for readers to ponder. Recommended for fans of imperial histories, royal scandals, or tragic romances.